In many cases, even the slightest mistake can have devastating consequences. Dealing with hazardous materials in the laboratory calls for extreme caution. Visitors attending analytica (May 10–13, 2016, Messe München) can find out how laboratory employees should act and what protective measures should be taken at a special show on Occupational Safety/Health and Safety at the Workplace in Hall B2. 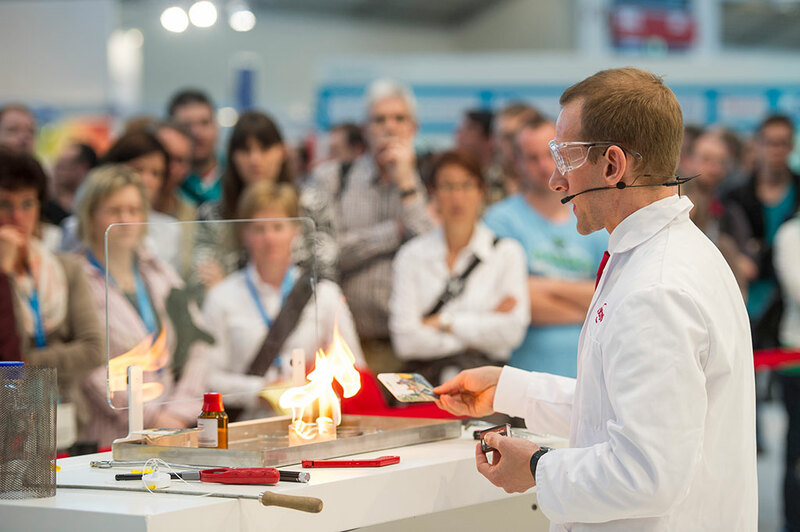 The special show will revolve around spectacular live demonstrations conducted by experts from asecos and Bernd Kraft on the topics “Fires and explosions”, “Handling hazardous materials safely” and “Avoiding health hazards”. In daily experimental lectures, the safety experts will demonstrate the hazards that can arise when various chemicals interact or are stored improperly. Even the smallest quantities of flammable hazardous materials and a spark are all its takes for an uncontrollable chain reaction. Additionally, visitors will also receive valuable basic knowledge for their everyday tasks in science, industry and the laboratory. That includes sufficient protective and preventative measures, the right personal protective equipment and a comprehensive understanding of hazardous materials and legal foundations. For example, Dr. Jochen Kraft, Managing Director at Bernd Kraft, will demonstrate with his presentation “The Safe Handling of Hazardous Substances/Avoiding Health Risks through the EMKG and PPE” the best ways to organize a laboratory to protect laboratory users’ health. Susanne Grödl, analytica's Exhibition Director: “The combination is just right: Our concept consists of information and exciting experiments, which allows us to transport the important topic of Occupational Safety/Health and Safety in the Workplace for all laboratory users in an impressive and informative manner.” The special show was a success from the beginning. More than 4,000 visitors experienced the experiments live two years ago, some of which ended with a bang. Once again, a variety of demonstrations are on this year's agenda: from rich and lean mixtures and exothermal reactions to small controlled fires and explosions. Naturally, visitor safety is guaranteed at all times. The experimental demonstrations last approximately 30 minutes each. They take place every day at 11:00 and 15:00 in German and at 14:00 in English.